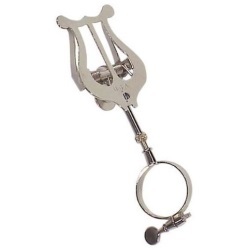 Nickel-plated marching lyre for Bb soprano clarinets. Easily attaches to the lower body tenon on plastic clarinets and enables the player to march with music flip-folio. Two-piece assembly.